It's no secret (or if it is, it's a very poorly-kept one) that Australia is home to some of the best heavy psych rock to be found these days. One of the biggest fighters for that scene, right up with Desert Highways, is the label of Pepper Shaker Records, which (in addition to the oft-lauded Mother Mars) has handled releases by Little Big Wolf and our subject today, Frozen Planet....1969. 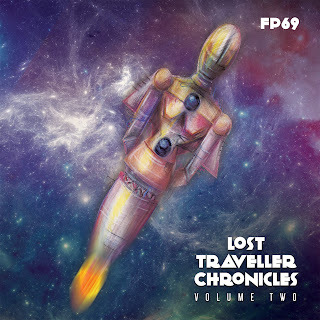 Continuing on from the first volume of their Lost Traveller Chronicles, FP69 pick up right where they left off, pulling listeners from the first into a swirling cloud of fuzz, feedback, thunderous drums, and space-brained riffs. It's not all your standard excellent heavy psychedelic rock, though, as the band has included touches of dub (for example, "Silver-Lined Cloud Lounge"), blues ("Aerial Burial"), shoegaze (that extra-long one I named earlier), and jazz ("Distant Star Island") for an ever-shifting, always-vivid cosmic blanket to cover your mind. While it's just a little over half an hour, the album feels so sky-fillingly large as to not seem wanting. Besides, room needs to be saved for Vol. 3, whenever it arrives, and should the opportunity for a vinyl release arise, no editing will need to be done to squeeze it on wax. Currently available on CD and digital, so kick back and give it a listen until you're orbiting out there with Frozen Planet.